Functionality and beauty do not exclude each other: Dental implants have been designed for firm and reliable hold and make the new teeth worn on them look just as the natural ones. If you chose conventional bridges, the teeth next to the gap would need intense sanding. Using an implant to close this gap, these lateral teeth remain unharmed and their natural substance is kept intact. 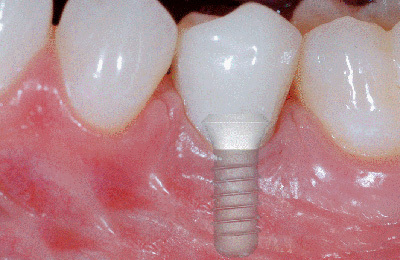 Implants transports chewing pressure to the jaw bone, keeping it occupied and hence stay vital. In case this stimulus is lacking, as it is the case when using conventional bridges or partial skeleton dentures, the jaw bone might regress causing a change to facial shape. Enjoy, speak freely, laugh and feast, despite your third set of teeth: No palate plates, no bruises!